Health officials across the country are monitoring the spread of measles across 21 states, according to the Centers for Disease Control and Prevention. 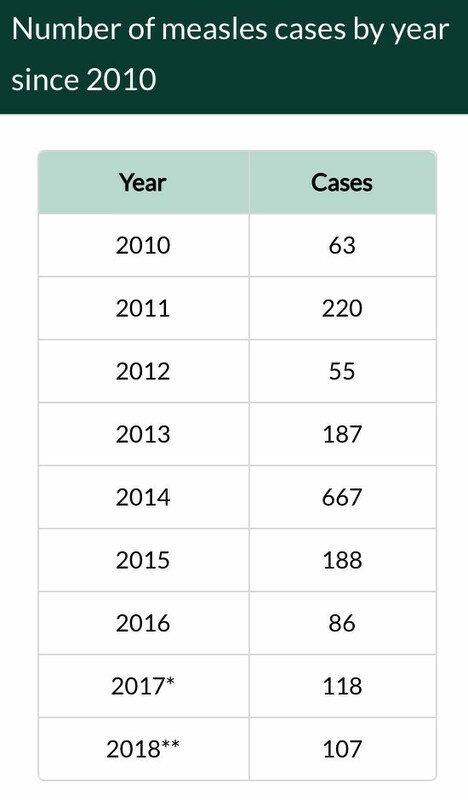 According to CDC, there have already been 107 cases reported this year. The majority of those cases were in people who were not vaccinated. Measles is an airborne virus that spreads through coughing and sneezing. Symptoms typically show up 10-14 days after exposure. 2018 is on track to become one of the worst years for measles in the last decade. In 2014, the United States experienced a record number of measles cases, with 667 cases from 27 states reported to the CDC. Arkansas, California, Connecticut, Florida, Illinois, Indiana, Kansas, Louisiana, Maryland, Michigan, Missouri, Nevada, New Jersey, New York, North Carolina, Oklahoma, Oregon, Pennsylvania, Tennessee, Texas, and Washington, and Washington D.C.